A long-time friend of mine was recently diagnosed with an aggressive breast cancer. From the time her diagnosis was confirmed to starting chemo was only about 2 weeks. In that time, her village rallied around her. There is a private Facebook group where she can post updates for friends and family, but more strikingly are the almost constant stream of encouraging memes, song lyrics, Bible verses, and posts from other members. Using a cool website called Lotsa Helping Hands as a hub, folks can sign up to mail her encouraging notes (goal = one/day) or send her family restaurant gift cards although meals have actually been taken care of for a year. She also has a plan in place to keep up with the kids’ schoolwork and transport them back and forth to their activities. I love when the village acts like God intended it. While her village was activating, I couldn’t help but think, “Adoptive families need this kind of support.” Actually foster families and families with kiddos with special needs should also be included. When we were at our lowest, we were almost bankrupt and I certainly wasn’t cooking for anyone. I continue to interact with families in crisis or who are just juggling more than the average who probably would actually feel like their head was above water with a daily note of encouragement and some unsolicited gift cards. I know when we’ve been the recipients of such care, we were beyond humbled but also really blessed. Adoptive families need folks to support them as if someone has a grave illness or a person just died. All. The. Time. Don’t wait for adoptive families to ask for your help. They’re either too busy drowning to scream or they feel guilty for asking because their attachment-challenged child charms everyone else while terrorizing her family members, so cries for help are actually straight up criticized. When someone has cancer, no one is waiting for her to ask, people just do. We need to have the same reaction to folks with kids from hard places. Assume every adoptive, foster, or special needs family needs some love. Between therapists and specialists, IEP and social worker meetings, and birth parent visits, even a family who isn’t technically in crisis has an overflowing plate that is pretty much out of their control. However, regardless of the public face forward, there are more families than you would ever imagine dying slow deaths. Our children’s needs are often invisible, and, furthermore, families often hide them to protect our kids. Besides no one was ever worse off because of a free meal and an encouraging word. Continue the love long after the child comes home. While I feel like the culture has made some headway in having events like adoption sprinkles and providing meals for the first few weeks after placement, the love needs to continue to flow long after those first few weeks of “adjustment.” Finding your sea legs after birthing a neurotypical baby may only take a few weeks, but adoptive families need permanent love in the form of meals, notes, and completion of household work such as laundry, shopping, and outdoor care. They are not just “adjusting,” they are permanently caring for a person (or people) with altered brain chemistry and it’s exhausting at its best and…well…no one actually wants to talk about the worst. For more ideas on how to love on families, check out these posts. Now, Go! Find a family (who is not us) and start pouring out the love! If you’re an adoptive, foster, or special needs family, share your story below and what it would mean to you to have practical support flowing your way. Posted in Adoption and Orphan Care. This is so good and yes, needful. I’d extend it beyond adoptive/foster families, too. Chronic health diagnoses and any family who has been thrust into either a prolonged season of being stretched or one going through a time of transition–even for positive things–are in need. Yes! So many populations that are underserved. I have been a special needs teacher for over 30 years. I was diagnosed with cancer in July of 2014, although, praise Jesus,, I am now cancer free. I was very blessed not to cook a meal for 8 weeks after surgery. I don’t think this is the norm, however. Special needs kids have rights! When you take on that precious child , you are also taking on the responsibility to fight for those rights! If you can’t get what you want from the school system, get an advocate! You will instantly see the school scramble to meet your child’s needs! All schools hate advocates! Don’t stop until you get what you think your child needs! You are in charge! Don’t let any school system make you think less! You can do this! What great news that you are cancer free! And thanks for the encouraging words about fighting for our kids! This would have changed my life! My children (3) came home almost 12 years ago and it has not been easy at all and it has been incredibly lonely! Our story is long, painful and disappointing due to one child with diagnosed FASD and three who struggle in their own ways with RAD. I have felt like a leper during these past years…very few people truly understand (or really want to understand) our reality. Thank you for putting this into words. Hugs and prayers for you, Denise! Wow! Did you hit the nail on the head. It is so hard to ask for help when we seem critical of our seemingly kind, thoughtful, charming child. He does only give it to us, or when he lies, we are the only ones who know. However, we have had support and understanding from most of our Christian church. They believe us, for the most part (there was one family that was difficult, but they have their own problems) help us out. They offer to take him places and listen when we need to talk. They help train up our child in the way he should go and he has gained much from them. I am sorry your church wasn’t the same. Maybe it’s time to look for new church. It makes my heart so happy to know that church has been your safe place! I can feel my blood pressure rising, though, about your school situation. “They’re either too busy drowning to scream for help or they feel guilty for asking because their attachment challenged child charms everyone else while terrorizing their family members . . .” totally says what I feel all the time. And not just the need for help is criticized, but also my parenting skills. If people could only walk in my shoes for a day. Thank you for validating me through this article, that I’m not lazy, incompetent, or a pushover, but truly overwhelmed and exhausted and in need of support. I kept thinking we’ll round a corner soon and things will get better. By the way, our 2 beautiful children are both adopted. Our son just turned 18 and our daughter will soon be 8. Both in different stages of life and both with their own special needs too. My daughter is the one terrorizing the rest of us. And yet I love them both with all my heart. Thanks for sharing and thanks for listening. I’m so sorry for what you’re walking through, but I’m glad you were able to come here and feel a connection. I wish I was connecting with families over something easier, but the beautiful and strong families that I have “met” here and in the real world have been a huge blessing in my life. So sorry. Praying for you. You do realize this kind of care your friend received is very rare for people with cancer? A lot of cancer patients don’t have much support at all. 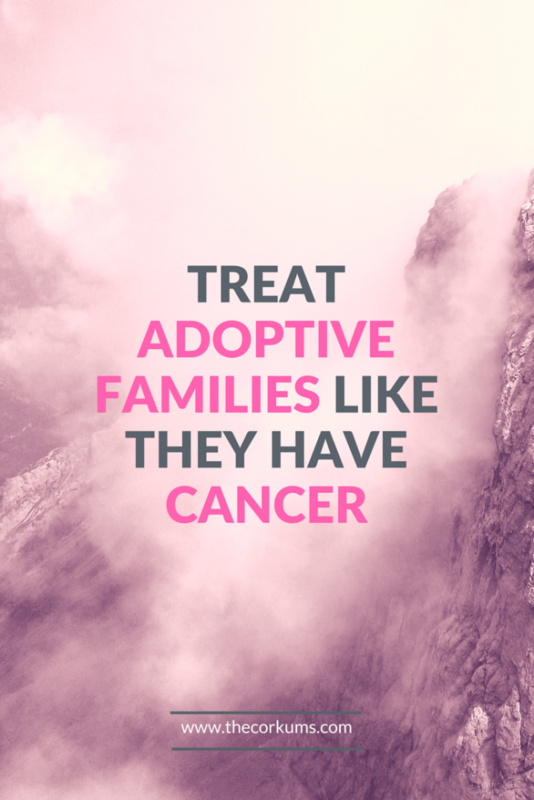 Both adoptive parents and cancer patients need support. Neither is generally very well supported. Thanks for sharing. Yes, there is so much room for improvement across the board for how we care for each other. Very well stated article. People dropped the ball right from the start. Church didn’t give us a baby shower when we started fostering our little girl. No one brought us meals either. Seems that the love and attention only goes to biological moms giving birth. Over the years we’ve actually learned to stay out of most “christian” groups of any kind, because of how judgmental they are, and how mean many of the kids and adults alike have been to us. I’ve received nasty emails from people, telling me I need to teach my daughter how to act and “train her up in the ways of the lord.” My daughter has FASD, she can’t help her behavior. People just don’t get it, they don’t want to get it, they don’t care enough to get it. Our few friends don’t REALLY get it, but at least they acknowledge they don’t get it and do what they can to support us. Thanks for sharing. I wish I could take away the pain and hurt from the brokenness. It breaks my heart when I hear stories of the church treating families that way. We have a child who has what I believe is undiagnosed FASD. I feel your pain! It’s such a challenging road.